Get Epson WF-2540 ink cartridges with impeccable quality and value from 1ink.com. 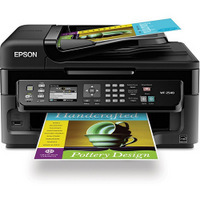 Our remanufactured ink cartridges are designed specifically to be compatible with Epson printers. Find the cartridge that fits the specifications of your printer and take advantage of the full 1-year warranty on all of our printing products. 1ink.com stands behind every Epson compatible ink cartridge in our selection. 1ink.com remanufactured Epson T200XL ink cartridges, also known as the Epson 200XL are a great alternative to the high-priced OEM brand. Our ink and toner are of such great quality because we subject each cartridge to demanding quality-control tests. This ensures that each Epson WF-2540 printer ink cartridge meets the original equipment manufacturer (OEM) standards for shelf-life, saturation, and best results. Whether you’re looking to stock up on replacement ink in your school or office space, or are looking to get your home printer back up and running, 1ink.com is your one-stop resource for all of your printing needs. Our incredible everyday low prices are complemented by our free shipping and handling on orders over $65. Connect with our customer service team for fast and friendly service. They will help you locate the right cartridge, advise you on installation methods, and provide you with the best shopping experience. Get high-quality Epson WF-2540 ink cartridges at a low price—shop 1ink.com today!